Carbon credits from waste management, viability of landfills, new technologies transforming waste into renewable energy, emerging disease and antibiotic resistance related to livestock waste in Asia, and the reduction and recycling of packaging waste - these will be the hot topics of discussions at the upcoming International Solid Waste Association (ISWA) Congress 2008 to be held in Singapore's Suntec City. 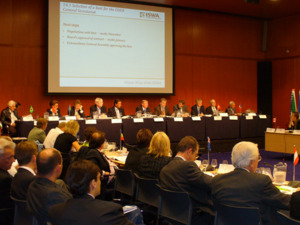 The annual ISWA meeting from 3-6 November 2008 expects more than 800 delegates comprising public and private executives and waste management experts from 60 countries and is co-organised by the National Environment Agency of Singapore (NEA), ISWA and Waste Management and Recycling Association of Singapore (WMRAS). Also for the first time in Singapore, there will be a 3R (Reduce, Reuse and Recycle) Packaging Awards that will recognise companies or brands that have made significant reductions to their packaging. This augments an existing Singapore Packaging Agreement between the NEA and five industry associations. Packaging waste, comprising mainly paper, plastic, glass and metal, accounts for one-third by weight of Singapore household waste. This is about 1,200 tonnes per day that can be a huge resource if recovered for recycling. NEA’s Chief Executive Officer Lee Yuen Hee says, “Waste is often seen as an inevitable and unwanted outcome of growth and development, and it is all too tempting to simply find a big hole somewhere remote to bury the waste. But if we look at waste as a misplaced resource, then the possibilities to reduce waste or even to eliminate waste nearly completely is indeed tremendous." “We are striving to bring together and showcase in this congress and exhibition, many possibilities to be resource efficient and minimise the production of misplaced resource. This would be the waste industry’s contribution to a more sustainable world,” says Lee. The event in Singapore marks the first time the congress will be held in Southeast Asia. This year’s theme is “East Meets Waste” and will focus on challenges Asian cities face in dealing with waste management as they urbanise and grow their economy. Key speakers at the meeting include Sandra Cointreau, Senior Solid Waste Management Advisor to World Bank, Sylvie Lemmet, Director of Technology, Industry and Economics, United Nations Environment Programme, Lee Yuen Hee, CEO of NEA, Dr John Keung, CEO of the Building and Construction Authority, and Goh Chye Boon, CEO of Sino-Singapore Tianjin Eco-City. Singapore and foreign companies in the waste management sector will also be taking part in an exhibition that is held in conjunction with the congress. They include Goldbell, Sembcorp, Keppel Seghers, LHT Holdings, Mercedes-Benz, Caterpillar, Sulo, Veolia and FAUN. For conference registration, visit ISWA.